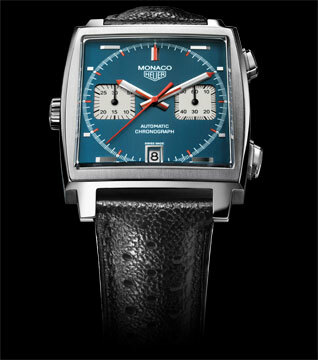 The iconic blue dial and square face of the original Monaco turned heads and turned the watchmaking world on its head. Instantly recognizable, repeatedly copied, never equaled. TAG Heuer has been the leader of Swiss Avant Garde watch making since 1860. But it took an American actor to bring the watchmaker into the realm of the über cool where it has stayed ever since. The actor was Steve McQueen. The movie was 1969’s Le Mans. The watch on his wrist was a Heuer Monaco (in 1969 the brand was still called Heuer – without TAG). Newly introduced, the Monaco at that time was little known outside the realm of Heuer devotees. It was McQueen who insisted on wearing the watch in the movie. Not only did he admire the Monaco’s revolutionary look, the name Heuer held special meaning in the racing world – McQueen’s based his character on Jo Siffert, the Swiss racing legend who in 1969 became the first race car driver ever sponsored by a watch brand – Heuer. In honor of this extraordinary watch and era in TAG Heuer history, the company has proudly republished the 1969 Monaco in a limited series of 1,000 timepieces with an exclusive case back signed by Jack Heuer and engraved in honor of its legendary ambassador Steve McQueen. Every detail from the iconic blue dial to pushbuttons at 2 and 4 o’clock, counters at 9 and 3 o’clock and a hand applied date window at 6 o’clock has been carefully recreated on the re-editioned Monaco 1969. Calibre 11 movement and diamond-tipped horizontal hours indexes round out the classic features. TAG Heuer opted for a sapphire crystal, rather than the original hesalite, which scratches easily, on the reissue – a small change to be sure, but one that means your Monaco 1969 Original Re-Edition may look even better than McQueen’s 50 years hence should you be one of the privileged few to own one. Having read the suberb review! I did some research on the Monaco range I fell in love with the McQueen Iconic blue face Tag Heuer. I purchased one and now I have 3 different Monaco models…and adding! I have watched the movie (Le Mans) a few times in the past and always wondered what sort of watch he was wearing never realising it was the the same watch I fell in love with many years later. That classic square look and vintage feel just sets your wrist on fire.